Paper Back : 176 Pages. Size 26 x 19 cm. 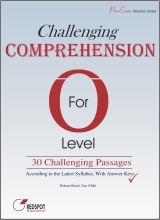 Contents : 30 Challenging Comprehension Exercises. With Answer Key. Special Feature : According to the latest revised syllabus (1123). About this book : This book contains comprehension exercises to improve the pupil’s Reading & Answering Skills. This new edition is written according to the Latest Syllabus (1123), and is equally good for syllabus 1125. The book is very helpful for children who want to improve their comprehension skills according to the new format.